Text Structure ChronologicalText Features Author's Note with detailed biographical information on Armstrong; additional resources (books, places to visit, and websites); special text used to distinguish Armstrong's words Twin TextGordon, G. (2012). Herman and Rosie. New York, NY: Random House.RationaleBoth Herman and Rosie and Just a Lucky So and So feature characters that find happiness and fulfillment through jazz music. Jazz can be tricky to teach to primary-grade students, since jazz has historically been and is still influenced by such complex themes as struggle, urbanization, and self-expression. However, Herman and Rosie teachers readers about jazz and some of these themes with a simple, beautiful story: two lonely, insignificant citizens of New York City find solace in jazz music until misfortune strikes (Herman loses his job; Rosie's singing school closes). After a period of sadness, the two find each other when Rosie traces the sound of jazz to Herman's rooftop, where Herman is playing his oboe. Friendless no longer, the two form an act and find success and happiness as jazz musicians. The simple, moving story sets just the right tone for teaching children about jazz. 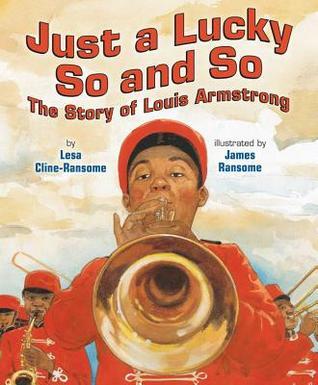 Used as an introduction to Just a Lucky So and So, Herman and Rosie will enable students to understand more fully and make predictions about Louis Armstrong's life. Louis is poor, but like Herman and Rosie, music helps make him feel better. When Louis gets sent to a juvenile home, he learns music as a way to make his situation not just tolerable, but enjoyable -- just as Herman plays his oboe to express himself during his lonely, jobless period. Based on Herman and Rosie, students should be able to predict that Louis will also be able to persevere and find success as a jazz musician. Thus, the books complement each other and work together to heighten students' understanding of the power of music.Strategy Application: DR-TA and Venn DiagramI would use both a Directed Reading - Thinking Activity and Venn diagram to help students engage in critical thinking and make connections between the texts. I would start by giving students classroom instruments (borrowed from the music teacher) such as a tambourine, rhythm sticks, finger cymbals, and shakers. Then, I would turn on some lively jazz music and ask them to play their instruments and dance! Afterward, I would ask: "How did making and listening to music make you feel? How about if you were upset -- could this help make you feel better? Why?" Then, I would collect the instruments and read Herman and Rosie. Some opening moves might be to study the cover and ask: "What are Herman and Rosie doing? How are they standing? (back to back) Why do you think they aren't looking at each other? Where are they? (in a big city) What are they doing?" I would identify Herman's instrument as an oboe. Turning to page 5, I would then ask: "How do you think Herman and Rosie are feeling? (sad) Why do you think they are sad?" I would then read the story, and afterwards we would talk about how music (specifically jazz music) helped Herman and Rosie in their lives, as well as how the characters' lives affected their music. I would record students' responses on a class chart.The next day, I would have the class review their notes on the class chart. Then, I would show the class Just a Lucky So and So: The Story of Louis Armstrong. I would tell the class that this was a nonfiction book about a real person's life, called a biography. Looking at the cover art (a young Louis is playing a trumpet), I would invite students to make predictions about what might happen to Louis. I would ask them to think back to what happened in Herman and Rosie to help them. Then, I would read the book, stopping along the way to let the students make predictions. For example, when we got to page 15, I would stop and ask: "What just happened to Louis?" (he was arrested, taken away from his mother, and sent to live in a home for boys) "That's a terrible thing to have happen! How would you feel if this happened to you? What are some things Louis might do to help him get over his sadness? Could music help?" After finishing the book, I would lead the class in a discussion about how music affected Louis' life, and how Louis' life affected his music. Responses would be recorded on a class chart.Finally, students would receive a Venn diagram organizer. One circle would be labeled "Louis Armstrong" and the other would be labeled "Herman and Rosie." In groups, students would complete the Venn diagram. Possible "overlapping"/shared characteristics might include: like jazz music, used music to help overcome problems, used music to express themselves, became jazz musicians. Possible "Herman and Rosie"-only characteristics might include: fictional characters, non-human (animals), play oboe and sing. Possible "Louis"-only characteristics might include: nonfiction (real), person, plays trumpet.After completing the Venn diagram, groups would share their results with the class, and I would record the answers in a class Venn diagram. Biography picture books are so much fun to read and Just a Lucky So and So does not disappoint. Louis Armstrong began life in what many would consider to be a rough start: living in poverty, working hard manual labor to help earn money for his family, and having a number of run-ins with the law causing him to be sent away to a home for boys. However Louis found the sound of jazz at a young age. He started playing a tin horn and then with a five-dollar loan he was able to purchase a second-hand cornet. Over time and with mentorship Armstrong’s musical ability opened doors for him. He traveled throughout the United States and Europe, recorded records in Hollywood, and performed on Broadway.Lesa Cline-Ransome has packed numerous examples of figurative language throughout the story; while James Ransome has created illustrations that lift off the page. There are many famous musicians from New Orleans, musical instruments and terms mentioned in the book. Making this a great read aloud for elementary music teachers. After reading the book students would benefit from listening to Louis Armstrong play. Finally inside the back cover are additional books, places to visit, and websites for students to research. Trumpeter Louis Armstrong was born and raised in the poorest section of New Orleans. Yet Armstrong became one of America's greatest jazz instrumentalists, because of the phenomenal music that was played in the streets of New Orleans. Young Joe Louis absorbed all the musical ability he could by listening to the funeral marches and the honky-tonk clubs where music flowed like water. Young Louis was especially partial to the of Joe "King" Oliver. As fate would have it, Louis was sent away to a home for boys because he had a run-in with the law. Unfortunately Louis was no longer living with his mother and sister but with other boys in the Colored Waif's Home for Boys. Louis tried to remain positive and while there he was able to concentrate of mastering playing the cornet. Louis was told that boys from his part of New Orleans did not belong in a band. Louis sang solos for everyone to hear, and the band director gave him a tamborine, the learned the drums, the bugle and then the cornet. Finally the band director ade him the bandleader. Then he was able to visit New Orleans and walk through his part of town playing great jazz songs, and see his mother among those standing in the streets of New Orleans as the band marched by. At age 14, Louis returned home and worked by day and played music in the honky-tonks at night. He met his idol who later became his mentor, and eventually trade his pawnshop cornet for Joe's used one. Joe left for Chicago and Louis filled in for him playing in the local clubs and honky-tonks! Joe sent for Louis four years later and Louis realized a dream come true. He began by playing behind Joe, but someone in a crowd asked that the old guys let the youngster play. After that Louis Armstrong realized after making it to the Big Time that he was just a lucky so and so! Book includes Author's notes on Armstrong's life. It also has a short biblliography, a list of places to visit and a genourous list of websites for further study. This book is full of beautiful illustrations as well. Lesa and James have done it again. This excellent picture book biography of Louis Armstrong is filled with luscious illustrations of scenes from Satchmo's life. It sounds unbelievable to hear that he was born "black and poor and lucky." How could those things all be true at the same time? But the narrative tells us how he grew up surrounded by the rich musical heritage of New Orleans, and how being sent to the Colored Waif's Home for Boys actually turned out to be a good thing for him. Spreads saturated with color show us Louis marching as bandleader, the full moon shining on the riverboat where he played swing music, and crowds dancing in the honky-tonks. The final scene of Louis surrounded by the Empire State Building, the Eiffel Tower, and marquis signs from famous clubs underscores how far he had come from that "one room with no lights and no running water" in The Battlefield.The author's note shares the names of some of his hits, details of his jazz recording with Duke Ellington, and his Grammy Lifetime Achievement Award. There is also a list of resources for learning more about Armstrong and his music. I received a copy from the publisher for review purposes. I read whatever I can get my hand on about Louis Armstrong. This is an accessible, young people's introduction to the Great Louis Armstrong. Loved the short peek into his life; loved the illustrations. Naomi chose this andas a part of her studies on a "famous musician". The wonderful music that filled our home. Brilliant! Naomi gave this book Five Stars - way up!! I would have preferred a bit more information about his life, but four stars all the same. Thought this picture book bio jumped around too much and started talking about other people before I understood who they were. Also, I was confused by the marching band. Was that the marching band from the boys home that he was sent to? Did they have extra-curricular activities there or was that a marching band that was across the street with the different organization? I like any book that honors the great Louis Armstrong. Cline, L. (2016). Just a Lucky So and So: The Story of Louis Armstrong. New York, NY: Holiday House.He was sent away to a Home for Boys after a run in with the law. He became a disciplined musician in the marching band. Once he returned home Joe "King" Oliver became his mentor and invited him to play in Chicago. This a good book in dealing with what a lot of younger blacks faced during the civil rights movement. The central theme is music. The media coexists with the text. I can use this book to teach my students that music can bring individuals out of a bad situation, it’s a lot of peoples “saving grace.” I can also touch on a history subject, one where music played an important rule during most blacks lifes during civil rights movement. Although his formative years were tough, Louis Armstrong grew up lucky in some respects. He had a loving family, and he was steeped in the musical influence that was then and still is so much a part of what makes the city of New Orleans unique. Without going into too much detail about his misdeeds, challenges, and time in a boys' home, the book follows Louis's fondness for music and the lucky breaks that came his way, thanks to his talented ways with a cornet. The illustrations are filled with the faces of happy listeners, thrilled by his music. An afterword provides additional information about this jazz giant who changed the face and pace of music. I'm not sure how clear his luckiness or his modesty is from reading the picture book. Perhaps readers could glean even more by listening to "Just a Lucky So and So," one of his recordings. There's a lesson here for youngsters too about not letting life's circumstances keep you down and taking advantage of the good things that come your way. I wish the story had addressed some of the prejudices that were rife at the time, though. Still, I will happily add this book to my collection of biographies about musicians. Louis Armstrong was troubled youth, growing up in New Orleans. He bought a cornet from a pawn shop and started his own band. Often in trouble with the law, he was sent to a boy’s home at the age of 11. Always interested in music, he worked his way to bandleader of the boy’s home, returning home leading a big parade. As an adult, he was mentored by many famous jazz musicians of the day. Who would have ever thought that a small boy from a rough part of New Orleans would grow to be the famous “Satchmo” Louis Armstrong? This fully illustrated picturebook biography includes an author’s note (more detailed biography) and resources, including places to visit and websites where you can see photographs and listen to his music. Too much name dropping though - without the background knowledge of who all these people were, it’s just a list of names. This would be a good springboard for a research project on Armstrong or Jazz. Cross-posted to http://kissthebook.blogspot.com CHECK IT OUT! 1. None2. First grade through second grade3. A biography of the life of Louis Armstrong. This book tells the story of one of the all-time jazz greats, the legendary Louis Armstrong. It starts with a childhood poor in money but rich in music, to how he learned the cornet, and finally how he became famous. 4. This book was a delight from start to finish, written in colorful language that reflects the joy of jazz. I love Louis Armstrong’s music, and learning about his life just made me love it all the more. Any child with musical dreams will adore this book and feel encouraged to make their dreams reality (and to check out Louis Armstrong’s music, too). The illustrations are wonderful, and the inclusion of quotes from the man himself on the pages of the book is a nice touch. 5. A unit on music or on the history of music could include this, without a doubt, as a way to include jazz. A unit on famous African Americans, perhaps as part of Black History month, would of course also benefit from this book. A unit on biographies could also use this book. A picture book bio about Louis Armstrong. I really enjoyed the watercolor illustrations. The text is informative and has a good message incorporated into it about not giving up on yourself despite whatever sort of negative forces exist in your world, but I was a little disappointed by the way Armstrong's troubled childhood was written. It felt jarring to me as a reader to see Armstrong be sent away to the home for boys when his troubles that apparently amounted to this action being required weren't addressed in detail in text, just lightly referenced to in support of an image of Armstrong holding a revolver while answering to the police.Back matter includes an author's note and resources, though the resources are printed on the inside of the back cover making it something that cannot be properly consulted if reading a library book. Grades 2-4+. A picture book biography of Louis Armstrong that focuses on his musical development from childhood to adult. More details on his life and music are included in an author's note in the back.I learned several things about Armstrong from this book even though it is only a picture book. I found it especially interesting to learn that "scatting" was invented when Louis dropped his music during a recording and ad libbed sounds to keep the recording going. Vibrant illustrations augment the story. Another great addition to the picture book biography options and musical biographies out there for kids. Louis Armstrong and his trumpet could have so much power that listening to him play remains an inspiration to many in the past and today. The problem I have with the book is that the book seems to attribute Louis Armstrong's success to "luck" a bit too much more than luck's fair share. While it is true that we all need some sort of luck in our life or profession, but for someone with his remarkable achievement in music, "luck" itself would not have been sufficient. The book describes his humble childhood, but he seems to have grown in a perfect world with no segregation or prejudice. Even his move to Chicago was purely at the chancy invitation of Joe, his mentor. Leave it to the Ransomes to create a lilting, rhythmic picture book biography of Louis Armstrong. Song lyrics dance across pages as readers learn of Sachmo's poor beginnings, struggles with the law, love of music, and eventual leap into fame. James Ransome's rich illustrations take readers back to a different time and combine with the lyrical text to convince the viewer that dreams can, indeed, come true because, after all, it's a wonderful world. The author's note gives additional information about Louis Armstrong, and resource lists can be found on the end papers. This is an exceptional book that is sure to win awards. It merits a place in any library serving children. This picture book's format reminded me of Doreen Rappaport's Big Words series in which informational text is paired with quotes from the biography's subject in this case Louis Armstrong. Includes Author's Note and a Resources page which is great because I'm sure readers would want to know more about this jazz legend! Do you know why Louis Armstrong is called Satchmo? If you don't, you should read this book and find out. If you do, then obviously you are a fan of Louis Armstrong and you should definitely read this book so you can learn more about what made him such a great cornet player. 3 1/2 stars. Would have given it more but felt like it took too long to get where it was going and then ended too soon. Illustrations are marvellous though and I loved all the info that it packed in (either throughout the story or in the end pages). A beautiful read-aloud for secondary on Louis Armstrong. Excellent illustrations. A very enjoyable and informative picture book biography. Lively look at Louis Armstrong's life with quotes from the great Satchmo himself. Great children's book on the great jazz musician. Lushly illustrated story of Armstrong's childhood and early life. Chronological story of Louis Armstrong from childhood to his success as one of the best jazz musicians of all time. Well done story in words and pictures. Includes more info and resources in back. Unfortunately, resources are on inside back cover and our library pasted book cover to it. Wow! A wonderful presentation of a great musician with just enough detail to keep the story moving and very interesting.